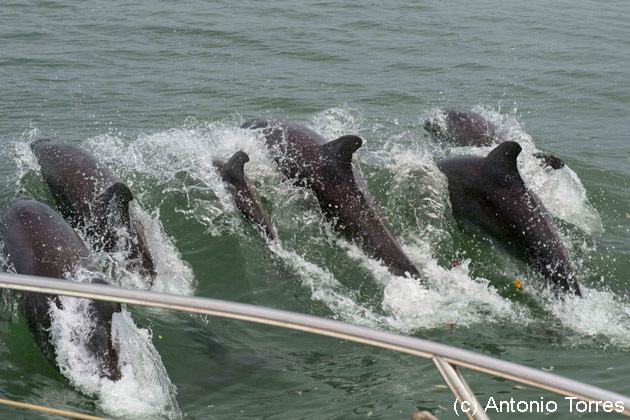 We are pleased to announce the publication of a new paper has just been published describing the occurrence of Atlantic humpback (Sousa teuszii) and bottlenose (Tursiops truncatus) dolphins in the coastal waters of Guinea-Bissau. More information is available on the Journal of the Marine Biological Association of the United Kingdom. Leeney, R.H., Weir, C.R., Campredon, P., Regalla, A., Foster, J., 2015. Occurrence of Atlantic humpback (Sousa teuszii) and bottlenose (Tursiops truncatus) dolphins in the coastal waters of Guinea-Bissau, with an updated cetacean species checklist. Journal of the Marine Biological Association of the United Kingdom, DOI: http://dx.doi.org/10.1017/S0025315415000661, 9 pp. Published online: 25 May 2015. There is a paucity of information on the cetacean fauna of Guinea-Bissau in West Africa. We compiled records published in the literature and novel unpublished sighting data (2008 – 2014) to examine the occurrence and distribution of cetacean species. At least 10 species were verified to occur in Guinea-Bissau waters, of which eight were documented from a small number of sightings, whaling captures or skeletal remains. By far the most frequently recorded species were the common bottlenose dolphin (Tursiops truncatus) (N = 146) and the Atlantic humpback dolphin (Sousa teuszii) (N = 110). These two species were sympatric in distribution, both being found throughout coastal waters from the northern regions of Canal de Jeta and Rio Mansôa south to the Rio Cacine and around the Arquipélago dos Bijagós. However, differences were apparent in their finer-scale distribution and in the distance of sightings from shore, with bottlenose dolphin sightings generally occurring further from shore (and especially in the region of the Canal do Gêba) than Atlantic humpback dolphins. Sightings indicate that both species likely inhabit Guinea-Bissau waters throughout the year. Dedicated systematic cetacean survey work is urgently needed in coastal Bissau-Guinean waters in order to ascertain the abundance, spatio-temporal distribution, population structure and causes of mortality of bottlenose and Atlantic humpback dolphins, particularly given the Vulnerable conservation status of the latter species. Clarification of the status of cetaceans in offshore waters requires survey effort throughout the Guinea-Bissau EEZ.